The Istanbul Ev i Brighton, England: Bestill nå! 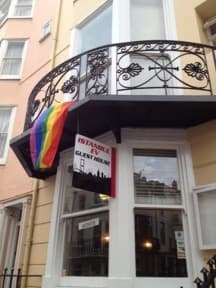 The Istanbul Ev Guest House is located in the vibrant Kemptown area, making it the perfect accommodation for those looking for a central yet affordable place to stay in the city of Brighton. 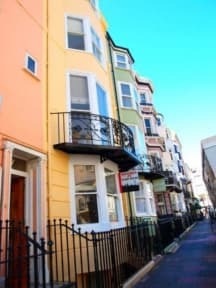 Our property is located just 2 minutes away from Brighton’s lively seafront, while the famous Brighton Pier and the Royal Pavilion are both less than 5 minutes away on foot. Public parking is available nearby at an extra cost. We offer single, double, triple, twin and family rooms, some of which have an en-suite bathroom with a shower and a partial sea view. The bedrooms are decorated in neutral colours and each offers a flat-screen TV, tea/coffee making facilities, free toiletries and free WIFI. Both English and continental breakfasts are served in the breakfast room in the morning. For evening meals, guests can find various bars and restaurants less than a 5-minute walk away from the guest house. Our friendly staff speak several languages (English, Spanish, Italian, French, Turkish and German) and will be more than happy to assist you at any time. We accept payment by cash & credit card. ATT. Customers will get a phone call or email after booking their room. In order to secure their booking, they will need to provide their three-digit card security number. We charge £5 for every card transaction.. This is a non-smoking guest house. Children under 3 years are free to stay with us with their family.